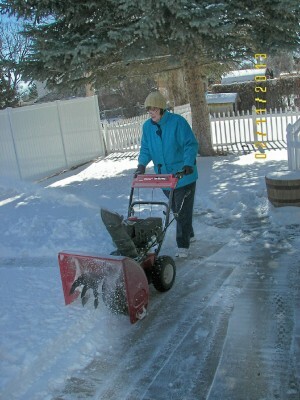 Our winter has again been mild, with little snow, but just to be prepared, we purchased "the kid", a new snowblower last October - (DH always MUST be prepared). It's more powerful than the old junker, and I've been eager to learn how to use it. This one doesn't take so much muscle, but has been living unused in "the barn" for months, because of no snow. "The Barn" is our name for the traditional garage, as we both come from country background. "The Kid" is the snowblower's name, like the poor step-child who is relegated to doing the hard/dirty work. Now, to explain about why I was eager to use this machine -- when I was 16, living on a farm and in charge of a number of my horses, and while some of my lucky girlfriends were getting cars at age 16, my father gave ME a manure spreader - yes, that's right, and I was a HAPPY girl! (a wheelbarrow can only do so much) I could hitch that International Harvester manure spreader behind the International Harvester tractor and take care of business. Today was THE day!!! After some guidelines and instructions, I CAN do it! Not bad for a Senior Citizen of ... uhhhh, "old"! Good for you, Elaine! Maybe you should "hire out" your services, LOL! When you get real good at it you can come visit and bring "the kid". We have had plenty of snow to keep you busy--with more in the forecast. You do look good behind that snow blower. Knowing you as well as I do....I would expect nothing less than BIG equipment. You go Girl!!!! We, gals, can do anything we set our minds to. If you can drive a tractor and one with a spreader behind it, you can obviously handle 'the kid". lol .. Your form is a perfect 10.